There are certainly going to be a few things that I will miss when we move out of the Atlanta area in a few weeks. One of those things will be my easy access to banh mi sandwiches. Another will most certainly be Dr. Bombay’s Underwater Tea Party. I had to leave work a little early today to be home in time to pick up our youngest from school. I don’t usually have this duty, but my wife had an afternoon appointment that ran late. When I got to the school to pick her up, I decided that we should take advantage of our “extraordinary” afternoon together by doing something fun. I suggested tea at Dr. Bombay’s. She agreed that it was an excellent idea. But first, we had one quick, little chore–bring a big load of books to the used book store, and convert them into a couple of books to add to the small stack of books I plan to read over the next twelve months. As is always the case, the used book store won’t take all that I have to offer. I did pass along twenty or so books, which I traded in for two new titles (Into Thin Air and Seven Years in Tibet). That left me with quite a stack of rejected books, though, which I would have to pass along some other way. 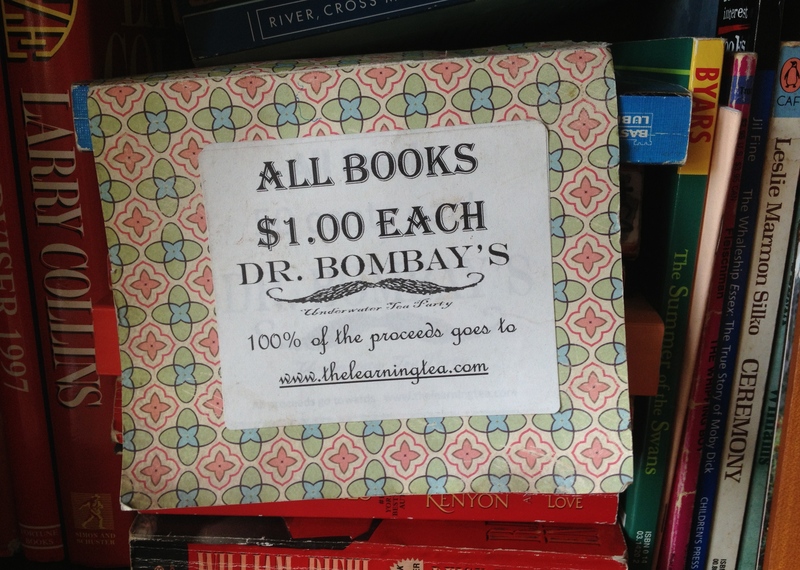 With our book swap behind us, off we went to Dr. Bombay’s. It’s a quirky, little shop in a quirky corner of town, with great food and great spirit. My daughter got the raspberry tea (with a side of ice cream, of course). I got the lapsang, with an order of samosas. So there we were, sitting at our table and sipping our tea, when I looked up and noticed all the books! I had forgotten that in addition to donating a portion of their profits to support their education program for young women in India, the shop also donates 100% of the money they raise selling used books, all of which have been donated by patrons. And my car was sitting right out front of the shop, loaded down with books! In a flash, I was back in the store with a stack of books, this time hopefully destined to be converted into school supplies and uniforms. It did not amount to the most significant donation of our super-abudance by volume or by weight, that’s for sure…. But it was certainly the most serendipitous. This entry was posted in Uncategorized and tagged abundance, attention, community, simple action. Bookmark the permalink. Huzzah! Nothing like a side of synchronicity with tea.